Richard B. Russell, a nuclear-powered attack submarine, was laid down 19 October 1971 by the Newport News Shipbuilding and Drydock Company at Newport News, Va.; her keel was authenticated by Mrs. Ina Russell Stacey, sister and official hostess for Senator Russell. 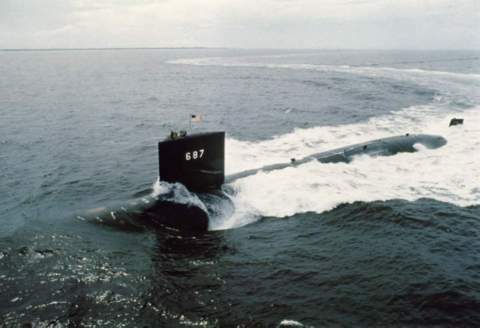 The submarine was launched at Newport News 12 January 1974; sponsored by Mrs. Herman E. Talmadge, wife of Senator Herman E. Talmadge; and commissioned 16 August 1975. After serving in the U.S. Navy for almost 18 years, Richard B. Russell decommissioned on 24 June 1994 and was struck from the Navy list that same day. Transferred to Bremerton, Washington, the boat was disposed of through the Nuclear Powered Ship and Submarine Recycling Program on 3 January 2003.